Ozo Camera: Nokia invents an eight headed Hal-9000 like device for capturing virtual reality scenes in high resolution. Copyright © digitalcolorist.com 2018. All rights reserved. Magni WordPress Theme by EckoThemes. Published with WordPress. Dolby: the ultimate replacement for a CRT monitor? Dolby's PRM-4200 is a milestone professional monitor in the transition from grade-1 CRT to the digital era. 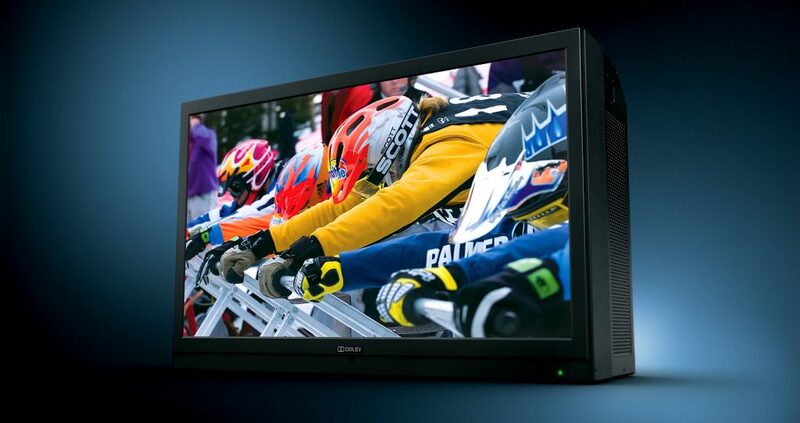 For years we’ve been looking for a perfect alternative to the Sony Grade 1 CRT grading monitor. I worked with the 32″ version on many many feature length projects and there really is no beating it for purity and a great gamma curve. Since those units have declined due obselecence and lack of parts we’ve all had to put up with inferior LCD replacement with nasty tinted shadows and narrow viewing angles. Dolby’s PRM-4200 is the most promising technology I’ve seen in a grading room for many years and reassuringly expensive. It was developed along with the Academy of Motion Picture and Arts (The Oscar Guys). It’s a large 42″ screen with amazing clarity, huge dynamic range and very deep pure blacks. All of this is thanks to its active backlighting technology which adds extra bits of luminance detail to their 12 bit LCD panel technology. It’s 42″ LCD of 1:1 pixels making 1920×1080 total resolution (no mushy interpolations here). The results are very impressive and I believe it’s a worthy contender for ‘the’ reference monitor of today. As well as being a really great HD mastering monitor supporting Rec709 (Usually around 80 Nits of luminance) it’s also cabable of DCI P3 mastering using it’s high luminance mode (around 300 Nits). It’s been used on production like Toy Story 3 and The Girl With The Dragon Tatoo HD master. I was lucky enough to see the PRM-4200 monitor recently and put it through various tests during a Dolby / Media Village roadshow in Bangkok. A number of well known local colorists and post professionals viewed demo material and also brough their own footage to display and grade with the DaVinci Resolve. The general consensus was that the monitor was far superior to any professional LCD monitor currently available but the die-hards still harked back to the Sony 32″ days! Fact is, even the Sony CRT could not emulate Digital Cinema luminance levels and color space. Although the PRM-4200 is not OLED technology it’s able to control luminance level very well with the 1500 LEDs it has in the backlighting panel. This means that areas of the picture can have zero or huge luminance. Due to it’s complex construction the monitor is pretty deep. Almost 60% as deep as a CRT but the pictures are worth it. The Dolby PRM-4200 is a great choice for a studio which needs to grade and master a variety of high-end projects for HDTV but needing the flexibility to produce DCI masters from time to time. It’s not got the size and field of view of a projector but it really meets the middle ground especially if space in your facility for projection is an issue. US List price is currently around $39,995 so you really have to NEED one. If you’re doing things right then one for each room! If you’re in the asia region and you would like to discuss this monitor please contact Christoper Tay at Media Village. For more details on PRM-4200 you can see the Dolby Webpage.